35/47 Amanda Jones I really loathe cartoons, and this one didn't make me want to commit seppuku. That says a lot, I think. 36/82 Kelly Metz A totally unnecessary addition to the Ice Age franchise - I really hope the producers quit while they are sorta ahead. Not horrible, but not nearly as entertaining as the first two. 68/159 David Mumpower The sequel is night and day better than the deeply flawed original. The key is focusing upon the animals and blowing off the human characters altogether. In another attempt to mine the CGI cash cow that has become so prevalent that it will soon be commonplace and blasé, 20th Century Fox will return to the first film that brought them significant success in the field of animation. Ice Age was released in March of 2002, where despite a rather rudimentary style, achieved a rather significant degree of success. The film debuted to $46.3 million in its first weekend before going on to accrue $176 million domestically and an additional $202 million in overseas markets. Now, we’ll see the popular characters in a new adventure. Wooly mammoth Manfred (Ray Romano), Sid the Sloth (John Leguizamo) and Diego the Sabretooth Tiger will all be on hand for a movie that kids will almost certainly be clamoring for. 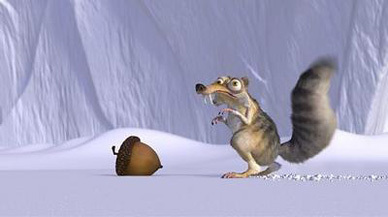 It’s almost certain that the hilarious Scrat and his quest for acorn will play a crucial role as well.